Lucius Flavius Arrianus 'Xenophon' (c. 86/89–c. 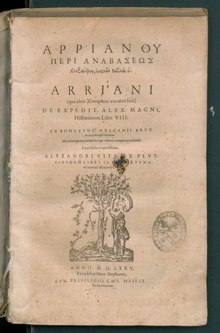 after 146/160 CE), known in English as Arrian, was a Greek historian and philosopher. Anabasis Alexandri I, 16, 7. Anabasis Alexandri II, 14, 4. This also is remarkable in India, that all Indians are free, and no Indian at all is a slave. In this the Indians agree with the Lacedaemonians. Yet the Lacedaemonians have Helots for slaves, who perform the duties of slaves; but the Indians have no slaves at all, much less is any Indian a slave. No Indian ever went outside his own country on a warlike expedition, so righteous were they. Arrian mentions with admiration that every Indian is free. With them, as with the Lacedemonians, he says, no native can be a slave; but unlike the Lacedemonians, they keep no other people in servitude. The History of India, by Mountstuart Elphinstone (Indica, ch. X and Ephinstone's India p. 239). This page was last edited on 28 August 2018, at 09:29.